The weather situation was very unclear. Kailash peak was in clouds, but the Drolma-La Pass seemed clear, so our guide Losang said we should go for it. At first, we were all colder than hell, but as we pushed forward, we heated up enough to be comfortable. 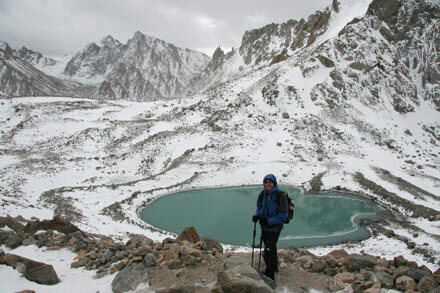 The trail across the pass, which is usually clear enough that trekkers don’t need guides, had disappeared beneath a blanket of fresh snow. We felt extremely happy that Losang had decided to borrow those shoes from his friend and come with us on the trek. 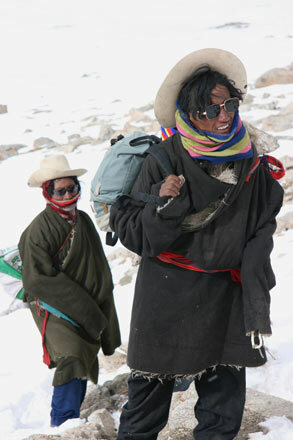 (Official Tibet guides often wait for trekkers at the base of the mountain in Darchen.) Since Losang was an ethnic Tibetan, he had completed the kora numerous times and was very motivated to do the kora again himself as each Kailash kora completed brings him one step closer to enlightenment. 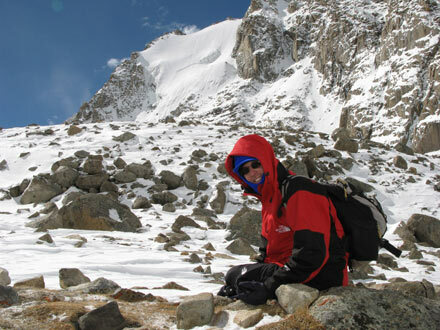 His experience at Kailash allowed him to easily guide us through the snow-covered boulders up the steep mountain slope. 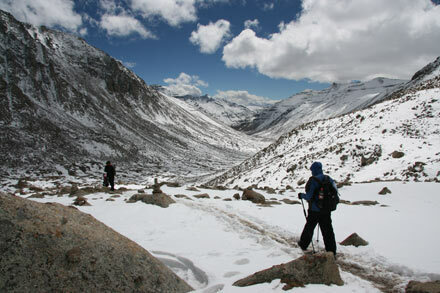 The trail, which is usually snow-free during the pilgrimage season, was hard-packed snow from all the pilgrims doing the kora. But recent snow fall had filled in the sides effectively rendering the trail invisible. If you stepped too far left or right, you fell off the hard-packed trail into the soft side snow, suddenly stuck up to your knees. (Thomas and I were both very grateful for the knock-off North Face Goretex pants we had bought in China!!!) Thomas seemed to have the uncanny ability to see where the hard-packed trail was, so I stayed close behind him. The exhausting climb became much harder when the winds kicked in early. The sky changed from clear blue to dark clouds and back within minutes. 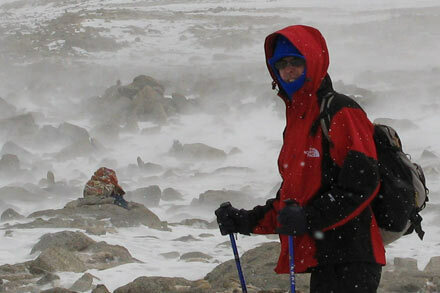 Gale force winds whipped snow into our faces – it felt like you were being hit with tiny splinters of glass. Of course, whenever the clouds swept in, the temperature dropped dramatically making the whole thing that much more difficult. At one point, as we topped a small ridge, we saw what looked like lifeless bodies lying on the boulders. It turned out to be several exhausted Tibetan pilgrims lying on rocks regaining their strength. 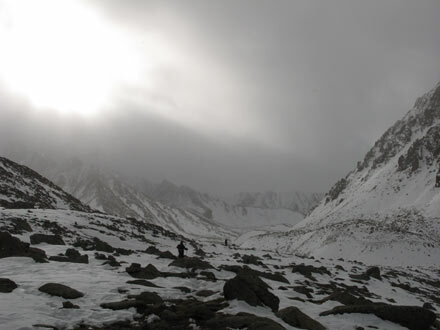 (Tibetan pilgrims usually attempt to complete the entire 52 km (33 mile) kora in one single day!) The pilgrims were wearing thick sheep skins with the fur inside. Many of the women had painted the outer skin with beautiful multi-colored abstract designs, which once again reminded me of Native Americans. As we passed, the bodies started stirring and the pilgrims ended up joining us on the trail up to the pass. We all moved inch by inch trudging through the snow surrounded by a panorama of jagged stone peaks. Kailash peak was partially visible as dark clouds moved over the summit. It really was one of the most dramatically beautiful moments of my life, all intensified by the spectacularly severe weather conditions and the pilgrims walking beside us. Strangely, moving up to the pass neither Thomas nor I had any problems with altitude sickness despite the fact that we were much higher than we had ever been in our lives. Irina and Dimitri, who have far more mountain experience than we do, moved on ahead with Losang leaving Thomas and me to follow their path through the snow. In a moment of stupidity, while stopping to go to the bathroom, I laid my gloves down on the path. Stupid!!! Propelled by a huge gust of wind, my gloves suddenly shot through the air landing in a pile of boulders twenty yards away. I can’t convey how terrified I was because the temperature was well below freezing and the extreme winds made the cold even more of a threat. Thomas screamed bloody murder at me for my stupidity and then disappeared down the path ahead. I tried to walk in the direction of the gloves, but I suddenly plunged into a deep patch of snow and couldn’t move forward. As I climbed out of the snowy hole, my icy hands freezing in the cold, I heard Thomas yelling, “I found them. I’ve got them.” He had walked further down the path and climbed into the boulders from behind. I don’t think I have ever been so relieved in my life. Gloves back on and hands warming, we continued up the trail stopping to rest and take in the phenomenal snowy wilderness. After another hour and much endurance, we finally reached the top of Drolma-La Pass 5,600 meters (18,400 feet). It’s the highest place by far that either Thomas or I have ever been, and this record is likely to stay unbroken for some time as there are not many opportunities for people to get higher without serious mountaineering experience. 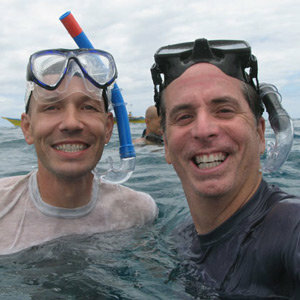 We thought the hardest part was behind us, but we were very mistaken in that assumption. Moving further along the pass, a new snow-covered valley opened up below us accessible only by a ridiculously steep iced-over path. I thought back to the rumors that the German who had died had fallen to his death. I wondered once again if that rumor had been correct. We slowly slid down the trail often on all fours. A beautiful, green alpine lake lay down below us ringed in by spiky white peaks. The strength of the winds continued to increase as noon approached whipping up clouds of snow. At one point climbing down the trail, Losang stopped to tell me something. While we were talking, a strong gust of wind knocked him right off his feet. Laughing, clearly shocked by the conditions himself, he pulled himself up and gestured to keep moving. We trudged to the bottom of the trail and began to cross the valley. 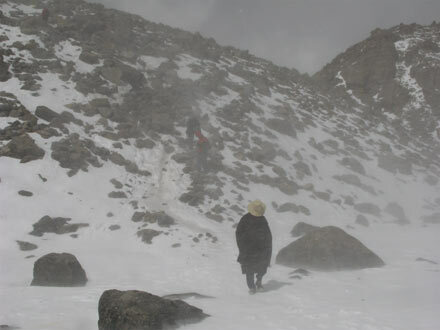 At times, the gusts were so overwhelming that we all had to stop moving and wait for the winds and stinging shower of glass-shard-like snow particles to stop. During this period, I did not take any pictures because I was afraid of damaging my camera, but Thomas did manage to snap the picture below, which shows a pilgrim with me and Losang in the background as we are just reaching the end of the trail arriving at the valley floor. It is one of the only pictures which conveys how extreme the weather became. But the challenges just kept coming. Weaving our way along the path of pilgrim footprints, we began to walk over sections of an iced-over river that braided through the valley floor. The snow made it difficult to tell if you were walking on dirt or the river. After what seemed like hours of slipping and sliding and hopping from rock to rock over the river, we plopped ourselves down behind a huge bolder to shield ourselves from the endless wind. Losang had gone ahead once again to look for Irina and Dimitri, so we were on our own. We refueled ourselves on chocolate bars and a can of Coca Cola we were dragging along for emergencies. Just as we were finishing, another trekker and her guide showed up and informed us that we were still two to three hours from the next monastery – I didn’t know whether to punch the guide in the face or burst into tears. I have never been so exhausted in my life, but somehow the chocolate and Coca Cola gave me enough energy to keep going. After endless river crossings and a lot of bitching, we finally spotted a pilgrim tea tent on the other side of the river. One last very precarious river crossing and we finally had shelter from the wind. A few cups of salted black tea and a half an hour warming up in the tent provided us with enough energy to walk the last hour to Zutul Puk Monastery. When I got inside our cold adobe room, I collapsed on to the bed and lay there for 15 minutes without moving. I have never been so exhausted in my life. Did I enjoy it? Absolutely! I think the extreme weather conditions made passing Drolma-La that much more amazing. The dramatic clouds, snow-covered mountains, the pilgrims wrapped in sheep skins – it was, perhaps, the single most intensely spectacular day of my life. It really did feel like a religious pilgrimage! Continue reading Mount Kailash – Day 3.